The Great Northern Hotel is on the corner of Scott & Watt Sts. Newcastle NSW Australia. In 150 years there have been 3 versions of the hotel. On this page I will endeavour to collect all the photos and info I can about the Grand Old Lady of Newcastle. N.B. I will refer to the versions by the numbers 1 (the first), 2 (second) & 3 (third). I will add credits if they are available. The photos will be divided chronologically. N.B., UD = Unknown Date; CC = University of Newcastle Cultural Collections; PB = Newcastle City Council Photobank. The Niagara Cake & Sweets Factory, I gather, supplied cakes & sweets for its cafes in Newcastle & Hamilton. It was on Bull Street, Cooks Hill, Newcastle NSW Australia (not sure exactly where). The former Niagara cake and sweets factory in Bull-street, Cook’s Hill, was sold at auction yesterday for £10,500. The 30ft. by 80ft. brick building is on land with a frontage of 80ft. and a depth varying from 121ft. to 139ft. 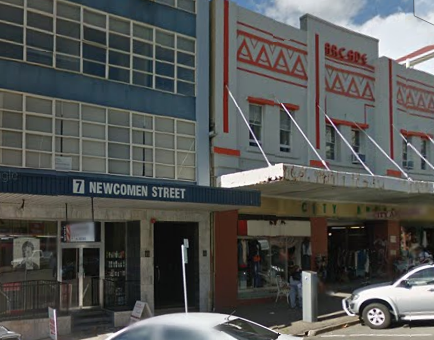 Last night I was searching Trove for ‘Newcomen Street’ results for a house on upper Newcomen Street. I checked ‘illustrated’ and up came a photo of the opening of the City Arcade (where the Municipal Swimming Baths used to be). 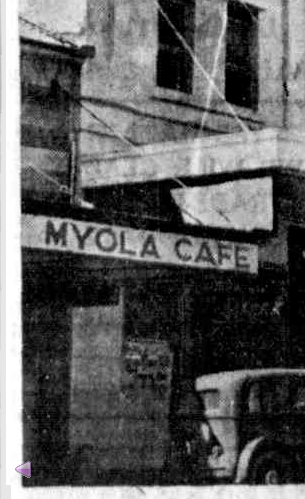 Also showing in the photo is the Myola Cafe, an establishment that until then was unknown to me. 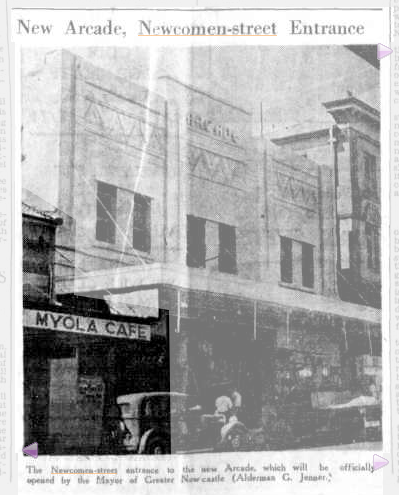 The Myola sat next door to the City Arcade, to the north or closer to Scott Street (see photo, above). Double Ghost Sign, Hamilton ! 2 GHOST SIGNS on top of the OTHER! Cnr. Beaumont & Everton Sts, Hamilton. Can you make out the brand names? White one says ‘tea’ I think. Photo taken 1/11/2015.